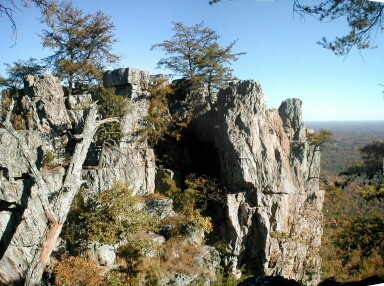 • Crowder's Mountain is one of the few mountain peaks that provides a hawk-eye view of the flatlands of the Carolinas. 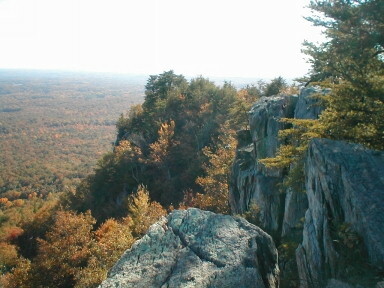 • Beautiful view of the rock bluffs that provide great repelling opportunities. • There are many chances to squeeze through rock crevices and view the surrounding area from a different angle. 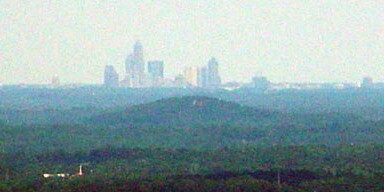 Leave Charlotte, NC to Kings Mountain, NC (20-30 minute drive from Charlotte). Take I-85 South to Exit 13. There are two trails to the top - 2.5 mile trail (gradual grade) and 1.0 mile trail (steep).